We are pleased to announce the availability of the IBM CLM as a Management Service (CLM aaMS) offering. This offering provides you with a managed, virtual private cloud environment to deploy Rational CLM (Rational DOORS Next Generation, Rational Team Concert, Rational Quality Manager, and Rational Reporting for Development Intelligence). IBM’s managed service is specifically designed to enable cloud delivery of IBM software products. With this offering, the IBM CLM Managed Services team will deploy the IBM products into an IBM CLM Managed Services Data Center, and monitor for 24×7 availability. IBM CLM Managed Services team will provide end-to-end services, overseeing the configuration and implementation of the IBM software products, and delivering ongoing infrastructure, application, and support. Also, at an additional cost, IBM and other skilled partners can assist clients with ongoing IBM software utilization. Accelerate time to value: Utilizing the cloud, it will help clients get up and running faster, providing their development teams with the necessary capabilities for success. Optimize operation costs: It will eliminate clients’ dependency on IT for deployment of development tools, reducing infrastructure costs and freeing up valuable IT resources. Scale up and down: It will provide clients with the ability to quickly scale without dealing with issues such as availability of IT infrastructure, skills availability, etc. Questions, comments and feedback on CLM, please contact Ratlsvcs@us.ibm.com. Can you elaborate a bit on the difference between JazzHub (connected to Bluemix) and this offering ? JazzHub is ideal for teams looking to start quickly, pro-type… without much process flow customization. This is a multi-tenant model. How does this differ from usual Rational CLM application ? I understand as this is on cloud, this is going to speed up the process? Is that correct ? is it cost saving in terms of licenses if we compare to the existing CLM setup ? CLM aaMS is a delivery method for CLM in the cloud. It is the same functionality from the CLM application perspective. Value is in the managed services compared with the on-premise model. You can scale up and down on a monthly basis as you need change. CLM aaMS is Bring Your Own Lic. model. This means you still need to have a Rational CLM lic. and we take care of the day to day operation and ensuring you are successful in using CLM. Hi Fariz – thanks for posting this – very useful description of the offering. Are there any geographic limitations on it’s availability? Can we , for instance, offer this from our European softlayer PODs? There no geographic limitations. This offering can use any SoftLayer data center. Hi Fariz, I’ll ask the same question as Stephen here. I understand that the CLM is hosted on IBM Infrastructure (in a SoftLayer Data Center). Is the CLM aaMS deployed on the Canadien territory? When you refer to the Virtual Private Cloud concept, what is the level of mutlti-tenancy that is being proposed here? Are we going to be sharing the same CLM service or infrastructure with other companies? Will our Data be segregated in a dedicated back-end? In other words how Private is the Private Cloud? We’ll we be able to migrate our current repositories? And Lastly, will it be possible to delegate the authentication of the users to our internal corporate authentication service (LDAP). CLM aaMS is a virtual private cloud, single tenant offering. As such, each customer get to select data center location and if you wish to have it in Canada, CLM aaMS would be deployed on the Canadian territory as there are SoftLayer Data center in Canada. You can see full list of SoftLayer data centers at http://www.softlayer.com/data-centers. As I said, this is single tenant offering. Each customer gets dedicated CLM instance(s). Regarding migration, you would need to assess what you have today and how we would migrate it. It is part of customer on-boarding process. Delegating the authentication of the users to customer internal corporate authentication service (LDAP) is our preferred method. This is also something we discuss during customer on-boarding process. Hope this helps. If you need further assistance, please contact your local IBM sales person. 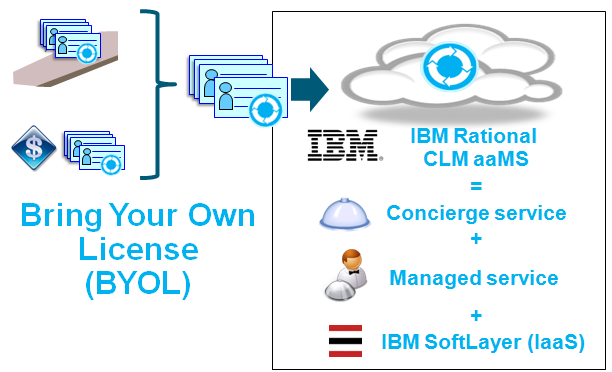 Fariz, what does it cost to the the CLM aaMS service if we bring our own client licenses? is there a trial period offered ? Cost depends on a few factors, which capacities, number of users, data center… As you can see, it is a customized offering and if you would like to get estimated cost, please send me an email at fariz@us.ibm.com and include capabilities interested, integration with other IBM products, third party, number of users, and primary location.